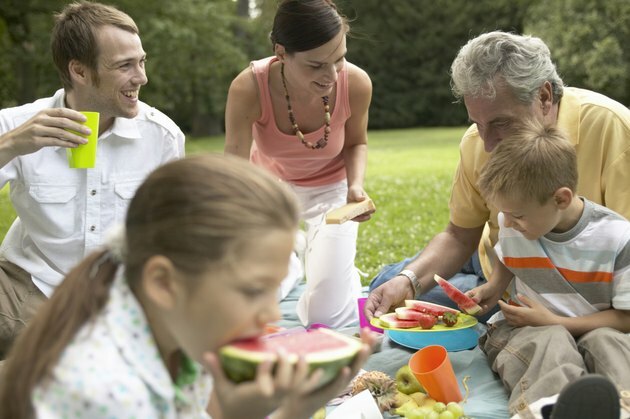 A picnic needs more than sandwiches, chips and soda; it needs an entertaining activity. Boredom can quickly cut a picnic short, but preparing games that kids and teens enjoy will keep the young people occupied and out of trouble. If there is a diverse age range and a big group, separate the big kids and the little kids so the competition stays fair. A photo scavenger hunt with a digital camera or the camera on a cell phone is a good game for a pair of teens, a teen and child or an adult and child to play as partners. Before the day of the picnic, prepare cards that have a list of items for the participants to find, such as two types of seeds, three different leaves, something that feels rough, two pieces of litter or something that feels smooth. Tailor the scavenger hunt to the location that you’re visiting. For example, if you’re going to have a picnic at the beach, add a shell to the scavenger hunt list. Give prizes to the participants who find all the items on the list or grand prize to the first group that finds all the items. Divide the kids into teams with an equal number of players. If there’s an odd number, ask an adult to volunteer. Alternate the participants by height, if possible, and make them stand leg-to-leg with the players on either side of them. The first person on each team starts the race by wrapping toilet paper around his leg and leg of the person to his right, as if they were going to do a three-legged race. Without breaking the paper, the second person in the team wraps the toilet paper around her leg and the leg of the person to her right. The routine continues until the toilet paper makes it to the end of the line. The first team to tie their legs without breaking the toilet paper wins. A wet sponge relay race requires a large sponge, pitcher and a bucket of water for each team. The teams should have at least four people of similar height, so you may need to separate the teens from the younger children. To play the game, the person at the front of a line dunks a large sponge into a bucket of water and passes it over his head to the person behind him. The second player in line then passes the sponge over her head to the next player. The players pass the sponge until it reaches the last player, who wrings the remaining water into a pitcher. The player at the end of the line then runs to the front and dunks the sponge into the bucket of water. The process repeats until water in the pitcher reaches the “fill” line. The first team to fill the pitcher wins. The parachute game is simple to prepare, is good for players of all ages and isn’t competitive, so there are no “winners” or “losers.” All you need is a parachute with handles around the edge and light objects like wiffle balls or balls made of foam. The participants stand or sit on the ground and follow a leader’s instructions, such as “Make little waves close to ground.” The participants can make “popcorn” fly around when the leader throws the balls into the middle of the parachute. By lifting their arms while holding on to the parachute, stepping underneath of it and sitting along the inner edge, the players create a bubble that slowly collapses as the parachute falls to the ground.